Update: This will be a full blown R3 Engine with full USB editable Sounds..
Der neue Microkorg XL ist technisch Nachfolger und praktisch mit der Klangerzeugung des R3 identisch, er hat auch USB und wird damit prima geeignet sein für Computermusiker und ist darüber auch editiertbar – wie genau und wie gut er über die Regler editierbar ist, muss sich zeigen. Sieht schonmal nicht übel aus..
Looks like there is no Step-Arper and a reduced Parameter Set or at least programmable via Display? So maybe it’s more a Nano than an XL Microkorg? But cool: Display shows Sound name. Less Knobs, but possibly not less parameters? >> mehr – Korg.de – Offenbar R3 Engine, unklar: USB? Weniger Parameter im Zugriff? New vintage design is both fresh and nostalgic. Korg’s renowned MMT Multi Modeling Technology, optimized for the microKORG XL. Sixteeen band vocoder for voice controlled effects. A gooseneck microphone is included, so you can begin vocoding right away. 128 powerful sounds are built-in and ready for immediate use. Intuitive sound selection; simply specify the music genre and instrument category. Seventeen powerful KAOSS derived effects. Newly developed natural touch mini keyboard is compact, yet easy to play. Editing software can be downloaded from the Korg website, as well as converted MS2000 and microKORG programs. Battery powered for on-the-go enjoyment. 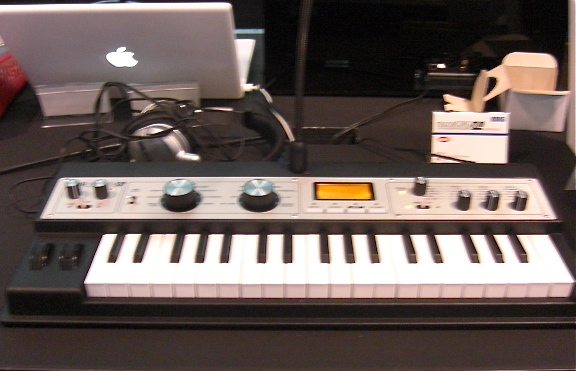 The microKORG has continued to be a best-seller since its arrival five years ago, and remains enormously popular today. This latest model boasts Korg’s powerful RADIAS/R3 derived MMT Multi Modeling Technology, as well as a powered-up vocoder. The updated ROM includes PCM data for recreating in-demand vintage keyboards such as piano, electric piano, and clav. Externally, the microKORG XL boasts a completely new vintage design with a textured black body and industrial silver panel. The interface has also been enhanced, making it easier than ever to use. Sound selection is controlled by two large dials; three smaller knobs allow the main parameters to be easily selected. The newly-developed mini-keyboard is firm and responsive for even greater playability. And best of all, it’s battery-powered so you can take it anywhere and still enjoy serious sound. For beginners, advanced musicians, and sound designers, this is a synthesizer that will stimulate your musical creativity. Two multi-mode filters, a drive/waveshaping circuit for distinctively distorted sounds, and EG and LFO for creating time-varying tonal change, provide plenty of parameters for serious synthesis. Virtual Patching simulates the patching capability of Korg’s classic MS series, and the arpeggiator can run six types of patterns, all adding up to a high degree of creative freedom. There’s also an external audio input jack, so you can process external audio material from a sampler or other source device. In the full-edit mode you have unlimited access to all of the microKORG XL’s synthesis parameters. Using a microphone, the microKORG XL’s amazing vocoder allows you to add vocal characteristics to any sound, creating everything from “talk-box” filtering, pseudo choirs, talking instruments and vintage Sci-Fi robots. You can also use a nother instrument – such a drum machine – to add rhythmic dexterity to your synth tracks. Our unique Formant Hold allows you to freeze the vocal input for continuous vocoder effects. In addition to simulating the classic vocoder sounds of the past, the microKORG XL also allows you to shift the filter frequencies (Formant Shift function) and adjust the level and pan of each of the sixteen bands, greatly altering the tonal character. This allows you to easily create fascinating textures and sounds that go far beyond traditional vocoding. A gooseneck microphone is included, so you can immediately start using these superb vocoder functions. 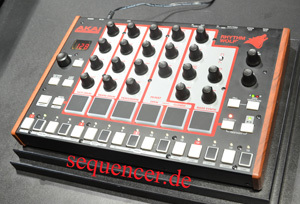 6 OSCs analog, 0 LFOs, 5 EGs, 1 FILTERs (4pole), TR sequencer, no arpeggiator more..